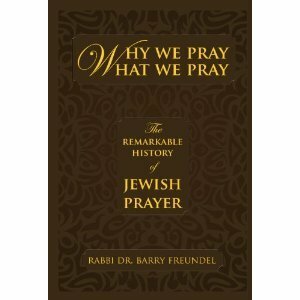 Rabbi Dr. Barry Freundel, Vice President of the Rabbinical Council of America, reveals the fascinating history of six significant Jewish prayers in six well researched, informative, thought provoking, and interesting chapters. He offers well over a hundred facts in his scholarly book that dispels the erroneous notion held by many people that the Jewish prayer book, the Siddur, contains a single view of Judaism, that the prayers we have today are the same prayers that were prayed in antiquity, and that they do not have mystical images and thoughts. These prayers are recited in ashkenazic synagogues, those comprised of Jews from Germany and the like, but are different or absent in sephardic liturgy , Jews descendant from Spain and similar areas. He shows, for example, that the best-known and central prayer of the morning and evening service, the shema, “Hear Israel, the Lord is our God, the Lord is one,” which is currently comprised of three parts taken from the Bible, with a insert of three words at the front, one at the end, and a curious verse near the front immediately after the quoted words, which must be said silently except on Yom Kippur, was not the original format of the prayer, and not the way the early rabbis wanted it to be said. The shema was composed to express the essence of the Jewish religion. It was formulated to be read, not prayed, as a period of daily study; hence, even today, it is called keriyat shema, “reading shema.” Thus, when it was established as a study session, it started with the Decalogue, commonly called “the Ten Commandments,” followed by what is today the first two of the three paragraphs, without the third and without the above-mentioned three short non-biblical additions. Freundel explains how the shema changed over the centuries. He describes why the Decalogue was dropped, how various substitutes were offered until Jews settled on what is today the third paragraph. His explains the causes: the intra-Jewish sectarian disputes, the persecutions by Romans, the notion by Jewish mystics that people can ascend to heaven and speak to angels, the mystical thought that humans are superior to angels, their notion that the number of words in a recitation can affect humans and God, their desire to have the number of words in the shema equal what they erroneously believed were the number of body organs, among other surprising things. In a word, the current version of the central prayer of Judaism was re-formed by horrendous internal and external conflicts and mysticism. His second chapter focuses on the Shabbat and holiday morning prayer nishmat, which begins “The soul of all lives bless your name.” This prayer prompts many questions that Freundel addresses. For example, the call to worship is barkhu, “Bless the Lord who is to be blessed.” Why, then, does the cantor take over the service with nishmat before barkhu in many congregations, while in others, he begins in the middle of nishmat? Freundel tells us that nishmat was originally sung joyfully as part of the Passover night Seder meal. It was then moved to Sabbath morning. He explains that the move was inspired by mystics who saw nishmat as a “groom going out to greet the bride,” an image of the Jew greeting the Sabbath with joy. Also, since nishmat mentions the soul, it fit with their view that on the Sabbath the Jew receives an extra soul. (This mystical notion also precipitated the practice of smelling spices at the conclusion of the Sabbath to help revive the Jew who was losing this additional soul at that time.) Then, it was also recited on holidays that were not Sabbaths. Among other curious and fascinating tidbits, Freundel tells how many Jews believed that nishmat was composed by the first Pope, Peter, who was Jewish, who wrote it to warn Christians that they were deviating too far from proper Judaism. Freundel states that this story is not true. Freundel addresses the monthly birkat ha-hodesh in chapter 3.This announcement/prayer has an unusual choreography. The congregation stands, two people are positioned on each side of the cantor, one of the two holds a Torah during the first part of the recitation, the cantor takes it and holds it for the last three paragraphs, and the rabbi makes an announcement about the time of the new moon in Jerusalem in the middle of the ceremony instead of the outset. Freundel explains the uniqueness of the choreography. He tells how the ancients established the onset of months, how the practice was challenged by Christians and stopped, the origin of its various parts, the introduction of somewhat arcane symbols of the ancient practices to help people remember Jewish history, symbols that virtually all Jews today no longer understand, mystical insertions, how a scribal error in wording became part of the reading, how liturgical material was moved into birkat ha-hodesh from totally unrelated sources, and how the prayer became an attempt to bring Jews to respect one another. Freundel saves his last chapter, some seventy-four pages, to the prayer that is most significant to most Jews. More questions are asked of rabbis about the kaddish than any other prayer. Jews who don’t observe the Sabbath dutifully recite the kaddish on the anniversary of a parent’s death. Yet Jews know close to nothing about it. The key element of their faith, that the kaddish was composed as a mourner’s prayer is wrong. There are half a dozen different versions of the kaddish that are recited today for different occasions. Some Jewish communities today have slightly different versions. The kaddish was originally composed to be recited at the end of a study of Torah. It was written in Aramaic, the language that people spoke when it was composed, the English of its time, so that people would know what they were saying. Later mystics who were convinced that people who are alive can affect the fate of a person who has died and that the dead in purgatory can hear the recitation and respond “may His (God’s) name be extolled,” turned the prayer into a recitation said at the end of life. A personal note: I am a descendant of rabbis. In my parent’s generation, my father and uncles held Ph.D.’s and honorary Ph.D.s. They were educated people. As a youngster, I asked one of my uncles: how can we say these prayers, mystical prayers with ideas that we can’t accept, images such as ascending to heaven, of God having human features, of humans affecting the dead. My uncle agreed that he also did not accept such concepts, but, he said, we recite these prayers as we recite those we like because they remind us of Jewish history. The prayer book, he explained, does not contain a single view of Judaism, but many. It is a compendium of statements about Judaism, and in this sense it is a holy history. We join with other Jews with their widely different views of Judaism in reciting and thinking about our divergent and stimulating past.